As we age, there are a number of important steps we can take to make our senior years a healthier and happier time for us. These steps can help stave off many of the most devastating conditions we face, including heart attack, stroke, type 2 diabetes, dementia, cancer, as well as other conditions, including weakness and frailty. The most important steps are simple lifestyle changes: eating a healthy diet and getting proper and appropriate exercise. Although most doctors and nutrition experts oppose the term “superfood”, pointing out that this term is often nothing more than a marketing ploy used to push the sales of specific foods, it is nevertheless a fact that some foods have greater nutritional value than others. Generally speaking, a diet rich in leafy green vegetables, cruciferous vegetables (broccoli, cabbage and cauliflower) along with berries, nuts, seeds, fish and healthy fats (found in avocados and olive oil) should constitute the bulk of a healthy diet. The avoidance of all simple carbohydrates, in particular the items that fill many tables: bread, pasta, rice, crackers, cakes, as well as sugar-laden sodas and treats, is also fundamental to our health. The golden rule of eating is to eat a diverse diet consisting of nutritionally rich foods, in particular the foods mentioned above, foods which are packed with essential vitamins, minerals, antioxidants and flavonoids. Though the term “superfood’ might be inappropriate, it is still true that certain products offer exceptional nutritional value. One important product which is rich in nutritional value is spirulina, a type of blue-green algae. There are many types of algae that are known to be extremely healthy, for example nori, the seaweed used in sushi, and although spirulina is less well-known, it is noteworthy for its many health benefits. Spirulina is a nutritionally rich food, containing protein, as well as a large variety of vitamins and minerals. As part of a balanced diet, spirulina can help to keep a person well-nourished. Spirulina is known to improve gut health by improving the overall composition of an individual’s gut bacteria. Many research studies have shown that spirulina supplements can have a positive effect on an individual’s lipid profile. 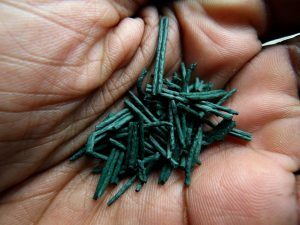 More specifically, spirulina was shown to significantly reduce a person’s total cholesterol in a most beneficial fashion: it both raises HDL and lowers LDL. Several small-scale studies have suggested that spirulina can also help control blood pressure. The studies were done on people who were both overweight and suffered from high blood pressure, so the question remains about whether it would have the same effect on people who were not overweight. A study from 2018 found that spirulina supplementation significantly lowered people’s fasting blood glucose levels. The results provided evidence that this supplement may help those suffering from type 2 diabetes. Studies from 2017 on animals support this claim. Animal studies on type I diabetes demonstrated that daily spirulina intake led to lower blood sugar levels, higher insulin levels, and improved enzyme markers. Since, as mentioned above, spirulina can improve both an individual’s lipid profile, help control their blood pressure, and help control their diabetes, it is clear that it can help protect a person from several risk factors for cardiovascular disease. A 2018 study highlighted the potential positive effect spirulina could play in treating a variety of mood disorders, in particular anxiety and depression. It is been suggested that spirulina is a source of tryptophan, an amino acid that supports serotonin production. It is an established fact that serotonin plays a fundamental role in mental health. Further research regarding this potential positive effect is required, however, before a definitive statement can be made. A 2014 review of the health effects of spirulina note that it is well-tolerated by most individuals and does not cause significant side effects. Nevertheless, it is always important to check with your doctor before taking any supplement. Although calling spirulina a “superfood” The take away message for us is to alter our diets in positive ways. We should add healthy and nutritionally rich foods to our diet and remove unhealthy and nutritionally poor foods. May be hyperbole, there is no doubt that it is a nutrient-rich food with many health benefits. Though algae and seaweed products are common in other cultures, they are relatively unknown in the United States. Expanding our sources of nutritionally rich foods to include algae and seaweed products, and in particular, spirulina, as part of a healthy diet, can play an important role in keeping us healthy in our senior years. At Atlantic Coast Healthcare and Rehabilitation Center, in Lakewood, NJ, we know that one of the many ways to our residents’ hearts is through their stomachs. Our staff includes a master chef and a group of culinary experts who work with registered dietitians to prepare healthful, delicious meals. We even take care to serve our residents on fine china to ensure that our meals are as pleasing to the eye as they are tempting to the palate.